Jakes was the normal word for lavatory or privy from the sixteenth century to the eighteenth. In King Lear II ii 74--6 Shakespeare wrote "I will tread this unbolted villain into mortar, and daub the wall of the jakes with him." The origin is obscure, but may be from Jaques' or Jack's house; see Harington. 'Japanese-style' lavatories, designed for squatting rather than sitting, look rather like bidets sunk into the floor, and have been called 'bombsites' by occidental travellers. However, the world's most advanced 'western-style' lavatories are also made in Japan. The Territorial Army unit on the Channel Island of Jersey was looking for a useful community exercise in 1992; so at the request of the Customs and Excise Department they built a new water-tank and lavatory alongside the customs hut on the Ecrehous, a chain of rocky islets between the north-east coast of Jersey and France. It was the first flushing lavatory on the Ecrehous, and it raised a mighty stink among those with holiday retreats there. Brigadier Raoul Lempriere-Robin is quoted as saying "Why can't they make do with an Elsan? ... 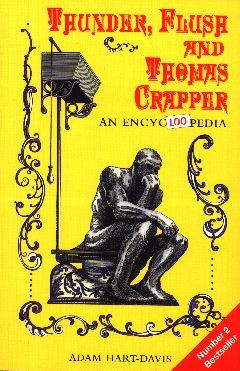 The toilet is now the grandest structure on the Ecrehous... To put it bluntly, it has been a bugger's muddle all along."